When a couple gets engaged the first thing they normally want to do is share the news with family and friends. An engagement party functions as an opportunity for a couple to gather each member’s friends and family to meet and establish deeper relationships. Essentially, it will be a party to allow others to congratulate a couple’s decision to take the next step. It is important guests have at least a month’s notice to plan on attending. 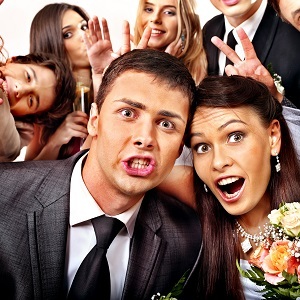 The engagement party should be held early enough that it doesn’t interfere with wedding planning, so having it 9 to 11 months prior to the wedding is recommended. This will be a great time to relax before worrying about preparations for the wedding itself. Even if a small wedding is the eventual end goal, that doesn’t mean an engagement party can’t be an open affair. Allowing family and friends to bring their family and friends as well, even they aren’t expected to be invited to the wedding. However, closed engagement parties are also an option if it makes the host more comfortable or other restrictions are limiting factors. Invitations for an engagement party can be as simple as an e-mail or customized homemade invitations for a personal touch. Since the wedding planning hasn’t started yet, matching stationary and color schemes is not necessary at this point. The primary goal is to have fun and let family and friends meet each other. If you are currently looking for a venue for your event, Stokely Event Center can make sure your special day is unforgettable. Guests to your reception will love the free-to-play games and our wide assortment of decorative signs. With the flexibility of catering in outside food and drinks, event menus can fit a variety of preferences. Our sound system, projector and screen are included for one great price to meet your audio/visual needs. If you are interested in reserving Stokely Event Center, please call us at 918-600-4448 or complete our online request form. We can’t wait to be part of your special day!